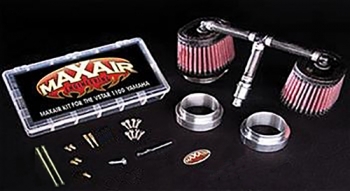 This kit is custom made for your Yamaha V Star 1100 (also known as the Drag Star 1100 overseas) to eliminate its restrictive stock air-box and allow increased air flow to the carburetors. The Maxair Kit for the V Star 1100 Yamaha will improve your entire power-band with up to a 20% increase in torque and horsepower (or more). Easy installation and our Award Winning Technical Support, guarantee that your Beast will be Unleashed in mere days! Filter Crossover Max-Tube (picture below) link the two filters balances them and increase flow and volumetric efficiency. This gives you the benefits of individual filters with the balancing effect of stock system !! Our unique Positive Crankcase Ventilation feature "pulls" harmful moisture and gases out of crankcase and burns them in the combustion chamber. This results in cleaner oil and longer engine life with no harm to the carburetors. This is also the cleanest running system for your bike as well as for the environment....This system also eliminates the smell of these gasses while riding. Also includes our custom machined, high velocity, anti-reversion filter adapters. It is our opinion that these adapters help to reduce the effects of reversion and increase air velocity. Includes all the jets and everything you need. You can leave your stock round air box in place for looks. Installed kit side view (pictured below) - our filters are well protected nestled up under the gas tank.. They are not seen when the tank is installed. Maxair Engineering has been recognized as an industry expert on the Yamaha V Star 1100 - Our products (including the Predator Pro) are sold and installed by Yamaha dealerships around the country! The MaxMix Thumb-Screws- This makes adjusting the hard to reach the idle mixture screws a breeze. Max-CSR kit - If your bike is 2006 and newer (California 2004 or newer) we highly recommend this addition for best performance. Now with greater jetting range! This is the next generation with our new adjustable needles. Our needles allow for tighter jetting tolerances. We saw improved throttle response and a 4 HP increase over the standard kit !!! Our Predator Pro jet kit now comes with an expanded jetting range. If you have modified your engine you can purchase an even more extended range here . Unless you have modified your engine you will not need this extra range. What is the Maxair Predator Pro and why should I purchase it for my V Star 1100 : The Predator Pro is a filter system that eliminates the stock restrictive air chamber and snorkel under the tank, allowing for maximum airflow and power gains. This kit has become well known among V Star 1100 aficionados, as the must have for the best power, while retaining real world drivability. Is the Predator kit is both an air filter system and a re-jetting system? Yes it is a complete system, with everything you need (minus tools) for install and tuning. Also included, are full color instructions and access to our technical support forum where we will "hold your" hand through the install process. I have heard about "POD kits". Is this a POD kit? No our system is not a "POD kit". POD kits are put together "ad hock" using the stock needles and no Cross-Over tube. The Predator Pro kit is a proven system that has been Dyno and road tested to make sure all the components work together to achieve optimum performance. Don't be fooled by imitations!! The heart of our system are the Predator Pro Needles, our Anti-Reversion Adapters, Cross-Over Max-Tube and our Positive Crankcase Vent System. The Predator Pro needle was specifically designed for the Predator system allowing for best performance, drivability and gas mileage. The stock needle was designed for a stock bike to satisfy EPA NOT for best performance when you eliminate the stock are system. Our anti reversion adapters increase air velocity and reduce reversion thereby increasing volumetric efficiency and power. There is simply no comparison to POD kits that use the stock needles and misc. parts. Our kit has also been made turn-key and we provide proper technical support. Our filters and adapters are designed to give the right flow and decrease reversion to provide the best performance. How much of a power increase can I expect with the Predator Pro? Please see the side by side Dyno charts on our website done by RoadBike Magazine. With a good aftermarket exhaust you should see a 20% increase over stock and often times better depending on the exhaust used. I have a Maxair Predator purchased before 2006, is the Predator Pro a new version ? Yes it is. The Predator Pro is the latest evolution of our legendary Predator kit providing even better power and throttle response. How is the Predator Pro different: The major difference is our new proprietary Predator Pro needle. The old style Predator used the stock needles which were designed to be used with the stock air system. We custom designed the Predator Pro needles especially for our air intake system, to offer better throttle response and general performance. Our test-bed V Star 1100 gained 4 hp over the old style Predator. Does the installation of the kit require any irreversible changes to the existing parts, especially the carburetors? For example, to install the new jets, does any drilling need to be done that would prevent a return to the original equipment sometime in the future? : No, the only drilling that is done is to remove the plug the covers the idle mixture screw so you may adjust them. This can easily be adjusted back to stock and the plug is completely unnecessary. Does the stock air filter cover remain on the V Star 1100 for aesthetic purposes once your new Predator system has been installed? : Its your choice. Our filters are hidden under the tank so you can leave the stock doughnut cover in place for looks or you can remove it for a cleaner look. I would like to know if there is any power increase if I use the stock exhaust? Yes you will see a noticeable gain in power. Not as much as you would see with a full system though.. We recommend a 2 into 1 exhaust for best performance. Slip-ons are a reasonable low cost option that will give you a tremendous power increase with the Predator Pro. Will installing the Predator kit have a negative effect on my warranty: No, This is a myth sometimes perpetuated by certain dealerships. See: Magnuson-Moss Warranty Act. We have dealers that install our air kits before the bike has even been sold to increase its selling potential. Often times a customer will purchase a bike and the have the dealer install our air kit and a set of pipes right off the showroom floor! I have another air kit on my bike now. Can I leave this on for looks after installing your product? : Yes you may and this is a great way to go. "The Maxair for Go, the others for show!" What are these Maxmix screws and why should I purchase them? The Maxmix screws found here The Maxmix - Pro Idle Mixture Thumbscrews for Yamaha V Star 1100 are thumbscrews that eliminate the need for a screwdriver when making adjustments to your idle mixture. We highly recommend these with the Predator Pro for ease of tuning. I ride in the rain quite often. Will rain be an issue with the Predator Pro? : No, rain will not be a problem at all. We have never had a complaint or issue due to rain with the thousands of bikes that this kit has been installed on. We have ridden our own test bike daily through torrential downpours with no problems at all. What gas mileage can I expect with the Predator Pro : The average is 42 to 48 mpg. Are these filters large enough for this application? : Yes . These are the size as the filters commonly used on the 1700cc Warrior. They provide more CFM than you will ever need. 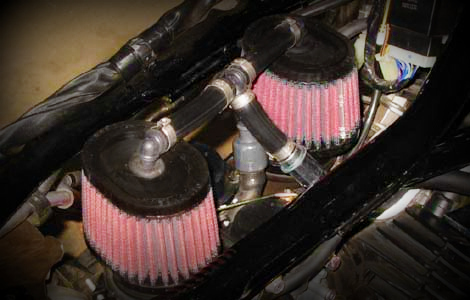 Remember, a filter too large can cause a decrease in overall performance and torque. Also our filter s designed for optimal flow while preserving proper filtration and together with our adapters reducing reversion for better torque in the lower rpm range. Can I install this myself? : Yes, most certainly. If you can change your oil and can follow instructions, you can do this in about 4 hrs. If any issues come up we are available around the clock on our technical support forum to "hold your hand" through the install process. What tools will I need for this project. : You will need a basic set of screwdrivers, sockets and wrenches. Also a clean work area. You will need a way to adjust the float level which can be done with a metric caliper. After the install you should synchronize your carburetors. You can purchase the SyncPRO CARBURETOR TUNER by Motion Pro or you can make your own very cheaply with instructions found on our technical support forum. Synchronizing your carburetors is a regular maintenance item that should be done periodically on and bike with multiple carburetors so this is a good tool for future use. I am concerned about adjusting my float level. Should I be and is this necessary? Adjusting your float level is a very simple job. 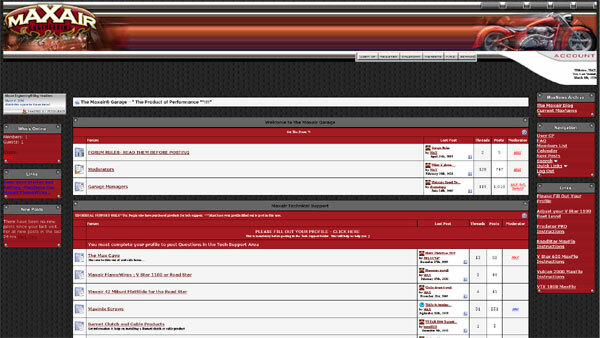 We have full color instructions on our technical support forum on how to do this simple procedure. We have gone to great lengths to make this a very simple task. As a result t is the easiest part of the install process and should not take more than 10 minutes. We also have a video on our tech support forum to guide you. My bike has already been re-jetted with another kit. Will I need to re-jet again? Yes, you need to re-jet using the jets we provide to accommodate the Maxair Predator Pro needle and the huge increase in air flow and power. Can my local dealer install this for me. Yes - Anyone who can read and follow instructions can install the Predator Pro kit. The chart below shows a "bone stock" V Star 1100 as tested by RoadBike Magazine using our Maxair Predator. The results in the are typical but we have seen better power increases base on the type of exhaust used! Peak Horsepower: Before 51.7 - After 61 ft ! Peak Torque: Before 55 - After 64 ft lbs ! Disclaimer: Any modifications to intake or exhaust systems on some vehicles may not be legal in some jurisdictions. Please check with your local authorities for specific legal standards. The Maxair Predator Kit is not EPA or DOT approved. Designed for off-road competition use. Purchaser is responsible for proper installation and tuning. At Maxair Engineering we pride ourselves on having the best support in the technical support industry! Since most of our customer install this product themselves we have earned a reputation for fast reliable technical support. The Maxair Garage is a private technical Support forum for customers to receive technical support and expertise. You will find all the help and information you need. There are links, videos and much more to assist you though the install. Bought the Predator Pro back in 2006 for my 2005 V Star 1100. Instructions were very easy to follow. What a difference it made in the performance on this bike! Have made some mods to my bike over the years and have had any questions regarding the Predator Pro answered promptly. The tech support is A+ and has helped me with small tweaks quite a few times. And oh yeah, 12 years later the bike still screams like a bat outta hell!!! Changed this out because needed more power and I have so much more take off power. Awesome product!